My RCUpay recipient did not receive the money I sent. Please confirm the email address or cell phone number you used to send. 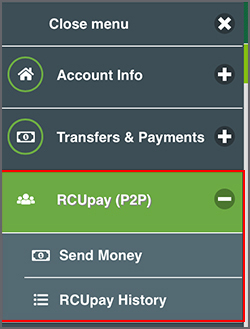 Review the details of your RCUpay transaction in the "RCUpay History" mobile menu option. 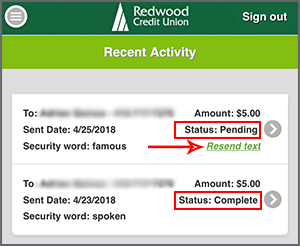 A Completed status means the account information needed to claim the funds was entered by the receiver. It does not mean that their routing number and account number information for the receiving bank or credit union was entered correctly. The receiver should confirm their routing number and account number with their bank or credit union. A Pending status means that the transaction has not been claimed. You can resend the text by clicking "Resend text". If the routing number and/or account number were entered incorrectly, and the funds cannot be deposited, they will be returned to the sender. If the routing number and account number are valid at the receiving financial institution, they may be posted to an account other than the one the sender intended. I sent money through RCUpay and my text was not received. I sent money using RCUpay. What happens next?